April 22, 2016. 6 pm. Co-hosted by ALC Oahu and La’akea Healing Services. March 16, 2016. 5:30 pm. Gallery McCube, Lalitpur. February 24, 2016. 7 pm. Dana Auditorium. February 9, 2016. 5 pm. Popcorn provided! February 5, 2016. 7 pm. January 27, 2016. Screening and discussion. December 3, 2015, 7:30 pm. Dinner, screening, and discussion. November 25, 2015, 8 pm. Cine-fórum organizado en el Salón de actos de la Facultad de Educación (USAL). November 18, 2015, 7 pm. Screening and Skype conversation with director Carol Black. November 17, 2015, 6:30 pm. Vanderslice Cabaret Room. November 14, 2015, 9 pm. Médiathèque de Soulan. November 13, 2015, 9 pm. Ciclo de Cinema-Fórum sobre Transição. November 10, 2015, 4pm. Screening for Native American Heritage Month. October 25, 2015. Screening, symposium, and cocktail reception. Moderated by Dr. Llewelyn Simmons. Panelists Dr. Eva Hodgson, Cordell Riley, Walton Brown and Lisa Marshall. October 18, 2015, 7 pm. Cine Studio, University of Nicosia. Discussion facilitated by Future Worlds Center. August 14, 2015, 7 pm. July 10, 2015. 7:30 pm. Flinders University, Adelaide on Kaurna Country. July 2, 2105, 8:30 pm. Cinéma le Rex de Foix. June 24, 2015, 8 pm. Staircase Theatre. May 30, 2015. 4:30 pm. Unitarian Universalist Church of Greenfield. May 22, 2015, 9:30 pm. Ginásio Clube de Faro. May 2, 2015, 5:30 pm. April 23, 2015. 5-6:30 pm. Screening and panel discussion sponsored by the Education Majors Committee and the Vassar Haiti Project. April 17, 2015. 11:00 am. Presented by Nawang Phuntsog at the TDRC, Pollak Library North 203. For further information, please contact the Asian Pacific American Resource Center at APARC@fullerton.edu or 657–278–3742. April 2, 7:00 p.m. Free. Screening and Skype Q&A with director Carol Black. Baer Theater, Morgan Park Academy Arts Center, 2153 W. 111th Street, Chicago. March 12, 2015, 12:30 pm. Collection Room, 3rd Floor Library Technology Center. Screening and Skype Q&A with director Carol Black. February 25, 2015, 5:30 pm. February 23, 2015, 7:30 pm. Askew Student Life Cinema, screening and discussion with Dr. Stephanie Zuilkowski of the College of Education. February 7, 2015, 1 pm. February 7, 2015. Drill Hall, Mullumbimby. Contact Philip Jackson for information. February 3, 2015, Bright Family Screening Room, 559 Washington St. Claire Andrade-Watkins, a professor in Emerson’s department of video and media arts, will discuss the film after the screening. Free. February 2, 2015, 7:30 pm. Basil Shippam Hall, Chichester, West Sussex. January 29, 2015. The Film Factory, 1126 Richter St., Kelowna. Screening and Skype discussion with director Carol Black. For information contact Kyle Hamilton, COTA Social Justice Rep.
January 16, 2015. Bethany Lutheran Church (3901 36th Avenue South). Potluck begins at 6:30pm, screening begins at 7:15pm. A discussion will follow. January 9, 2015, 8:30 pm. Screening and discussion with director Carol Black. November 22, 2014. Screening and discussion with director Carol Black. November 22, 2014, 8 pm. 1418 W. Howard St, Chicago. November 17, 2014, 6:30-9 pm. “As part of Native American Heritage Month and International Education Week, the Chief Diversity Office, International Student and Scholar Services, and the Native American Council are pleased to announce a showing of the documentary Schooling the World, followed by a global panel and discussion.” Iowa Memorial Union, Iowa Theater, Room 166 125 North Madison Street, Iowa City. November 14, 2015, 7 pm. November 13, 2014. Augusta City Library. November 8-12, 2014. Screening for all attendees at conference for media acquisitions and technology. Embassy Suites Charleston Area Convention Center, 5055 International Blvd., Charleston, SC. November 5, 2014, 7 pm. October 30, 2014. 11:30 am. October 28, 2014. 6:30-8pm. Screening and conversation at Migration Brewery, 2828, NE Glisan St., Portland. October 24, 2014, 3 pm. EMPATHY CAFÉ AND CONSCIOUS MOVIE NIGHT, Capital NVC, Washington, D.C.
October 24, 2014. 6:30-10 pm. October 19, 2014. Comrades Club, Haltwhistle. October 13, 2014. 6-8:30 pm. October 6, 2014, 7-9 pm. Screening and Q&A with Director Carol Black. August 25-29, 2014. Keynote presentation by Vatinasa Dr. Salu Hunkin-Finau and screening of clips from Schooling the World at the Third Samoa Conference. August 1-31, 2014. Online virtual screening during the month of August and 8/14 online video discussion with director Carol Black. Check back for details on how to access. July 6-12, 2014. A collaboration between St. Mark’s School and the Salzburg Global Seminar in Austria. Screening and discussion of Schooling the World at 7:30 pm on July 11. July 8, 2014. 6 pm. Screening and discussion: “Deschooling Our Communities.” Rua do Catete 92, Rio De Janeiro. June 27, 2014, 5-7:00 pm. Screening and discussion with Dr. Susanah Lily Mendoza, Professor of Intercultural Communication at Oakland University. Seminar Room, (2nd floor) GT-Toyota Building, Asian Center, University of the Philippines, Diliman, Quezon City. June 10, 2014. Screening and discussion with Jiri Benda, 2012 volunteer in Ladakh. 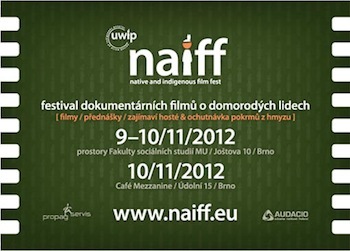 Organized by La Ngongpo, a project of the Multicultural Centre of Prague. June 8, 2014. 3 pm. May 20, 1014. 7 pm. Schikaneder, Margaret Straße 24, 1040 Wien. March 14, 2014, 7-8:30 pm. Alternator Centre for Contemporary Art, 421 Cawston Ave, Kelowna. “The AlterKnowledge Discussion Series brings together faculty and/or students affiliated with the Cultural Studies Program at UBC’s Okanagan campus and members of the Kelowna community to foster discussions about topics related to culture, power, and identity.” Screening followed by discussion hosted by University of British Columbia Associate Professor of Cultural Studies David Jefferess. March 8, 2014. Thirroul Library. February 3, 2014, 2 pm. January 8, 2014, 6:30 pm. December 11, 2013, 5:30 pm. Screening and discussion with Professor Vanessa Andreotti. December 4, 2013, 8 pm. B. Bakala Cinema Hall, Brno. December 8, 2013, 6 pm. Galerie Langhans, Praha. November 16, 2013, 7 pm. November 12, 2013, 7:30-9:30 pm. Screening and Skype Q&A with director Carol Black for International Education Week. Janet Leigh Theatre, 3601 Pacific Avenue, Stockton. November 6, 2013, 4 pm. October 22, 2013, 6 – 7:30 pm. October 16, 2013, 12 pm. Screening and discussion. September 30, 2013, 7-9 pm. September 26, 2013, 6 pm. Mbira Month Film Screening. 328 Herbert Chitepo Avenue, Harare. September 18, 2013, 2 pm. Mbira Month Film Screening. 57 Mazowe St., Harare. August 31, 2013. 10:30 am – 1 pm. Screening and dialogue after the film. August 20 – September 8, 2013. Details TBA. July 23, 2013. 7 pm. 909 12th St. Sacramento. For information: 916-448-7157, sacpeace@dcn.org. July 7, 2013, 6 pm. June 3-28, 2013. Peru Summer Institute: Ecology, Technology, and Indigeneity in the High Amazon, sponsored by University of British Columbia. June 16, 2013. 3 pm. May 29, 2013, 6 pm. Channel Islands Road, center of campus,UCSB, Santa Barbara. May 24, 2013, 7 pm. Frances Crowe Community Room, 60 Masonic Street. Enter via Woodstar Cafe. April 17, 2013. Two screenings: 104 Allen House, noon, and 216 Living/Learning Center Commons, 7:30 p.m. Information: ccpuvm@uvm.edu. April 12, 2013. Screening followed by discussion with Gustavo Esteva of Universidad de la Tierra. April 10, 2013, 6 pm. March 15-17, 2013. Dual screening of “Schooling the World” and “The Economics of Happiness” by Helena Norberg-Hodge, John Page, and Steven Gorelick. Talks and workshops with Helena Noberg-Hodge, Manish Jain, and more. March 13, 2013. 6 pm. Sponsored by UBU Amnesty International. March 1, 2013. 9:30 am – 3:30 pm. FREE Symposium hosted by the Environmental Education Caucus in the Faculty of Education. Neville Scarfe Building – Room 310, 2125 Main Mall. February 27, 2013. 6:00 pm. University of British Columbia, Dodson Room (302), IKBLC. February 18, 2013. 6:30 pm. 17 Kasr El Nil St. Downtown Cairo. February 14, 2013. 7:30 pm. Boston Tea Party, Honiton High Street. Screening and discussion. February 12, 2013. Contact Scott Jackson for information. February 10, 2013. Ground Zero Basement, Rensselaer Polytechnic Institute. February 5, 2013. 8 pm Eastern, 5 pm Pacific. Virtual screening and live interactive interview with director Carol Black on the web interview series The Future of Education. Click link above for details on how to log on. February 1, 2013. Co-sponsored by the Global, Environmental, and Outdoor Education Council of the Alberta Teachers’ Association and International Week at the University of Alberta. January 30, 2013. 7 pm. Screening and Skype Q&A with director Carol Black. University Lecture Room. January 28, 2013. 7 pm. “Education and Autonomy:” Schooling the World screening and conversation with Dan Baron. January 16, 2013. Diamant College, The Hague. January 13, 2013, 4–6 pm. Screening and discussion, 9500 Gilman Dr. “UniTierra Califas Sur is a temporary autonomous zone of knowledge production aimed at creating spaces of convivial learning, using zapatismo and horizontal discussions in conjunction with Universidad de la Tierra in Oaxaca, Chiapas, San Jose, and Los Angeles. This film will discuss the concept of “education” as a colonial system vs. communal learning. Contact Leslie Quintanilla for more info. December 11, 2012. Screening and debate: “The Role of Modern Education in a Multicultural World.” With Shumai Lin, Trey Menefee, Danielle Biddle, and special guests Mark Bray and Liz Jackson. Action Network. Contact Sophie Major for information. December 6-9, 2012. Cross Cultural Studies in Bilingual Education Program. November 17, 2012, 6:30 pm. Andrea Cadwell, an AUNE student who spent part of an internship in Ladakh, will introduce the film and give a personal account of working with Dr. Vandana Shiva, who is in the film, and the Women’s Alliance of Ladakh. November 15, 2012. Aleshire Theatre. Sponsored as part of International Education Week. Check back for details. November 6, 2012, 7-9 pm. Screening and panel discussion with Satwinder Bains, UFV, Director of Centre for Indo-Canadian Studies. Charis Bersaglio, PhD. cand. Balsillie School of International Affairs. Patti Victor, TWU Siya:m. Richard Taylor, Executive Director of Wellspring Foundation. November 3, 2012. Columbia College | Dogwood Forum, Sonora, CA. November, 2012. Check back for details. October 31, 2012, 12:30 pm. October 25, 2012. Alameda Lorena 355, Jardim Paulista. October 15, 2012. Screening and Skype Q&A with director Carol Black. Friday, October 12, 6-8 pm. El Centro (Building 406), behind Davidson Library. TRANSITION TOWN TOTNES, Totnes, U.K.
Wednesday, October 10, 2012, 8 pm. Screening and discussion with Helena Norberg-Hodge. Totnes Methodist Church. Wednesday, October 3, 2012, 7 pm. Arts Council of Princeton. September 22-29, 2012. Shaw Theatres Lido, Singapore. Sponsored by Dharma in Action. September 11, 2012. Rotterdam High School. Tuesday, July 3, 2012. Screening followed by Skype discussion with director Carol Black. June 25 – July 1 2012. Schedule still being finalized – screening or virtual screening online for conference attendees. Check back for details. June 12, 18:00. Glotta Nova, Poluanska Road 95, Ljubljana. June 3-6, 2012. Centre Communidée, Montréal. Sponsored by Montréal Homelearners. Thursday, May 31, 2012. 18:00-20:00. May 29 – June 3, 2012. West Chester University, West Chester, PA.
Friday, June 1, 2012. St. Mary’s Anglican Church gym. Contact Jodie Payant for information. Sunday, May 20, 2012, University of California, Berkeley. Contact Michael Bakal for information. Friday, May 4, 7 pm. Screening followed by live host-led discussion. May 1, 2012, 18:00-20:00 GMT. Screening and World Cafe with lecturer Robert Cook, University of Plymouth. KEVICC Ariel Theatre, King Edward VI Community College. This screening has been organised by a postgraduate Student of Economics for Transition at Schumacher College at Dartington, in collaboration with Earth Inheritors, students at KEVICC High School, TTT Education group, Schumacher College, and more. April 25, 2012, 7 pm. Torre Norte. FIRST METROPOLITAN CHURCH, Victoria, B.C. April 23, 2012. 7 pm. 2012 Climate Action Film Series. Friday, April 20, 12:15 pm, and Saturday, April 21, 2 pm. Cornerstone Arts Center, Colorado College. Wednesday, April 18, 9 am to 12 pm. Screening and discussion with Dr. Juan Meléndez & Dra. María del C. García Padilla, Faculty of Education, & Prof. Mayra Rivera Rivera, Faculty of Humanities. Wednesday, April 18, 6:45 pm, Lesley University Amphitheater. Screening and Skype discussion with director Carol Black. Tuesday, April 17, 8 pm. Grand Valley State University Loosemore Auditorium. Thursday, April 12, 2012, 7 pm. Screening and discussion with director Carol Black. Wednesday, April 11, 2012, 5-7 pm. Askwith Hall, 1st Floor, Longfellow Hall. 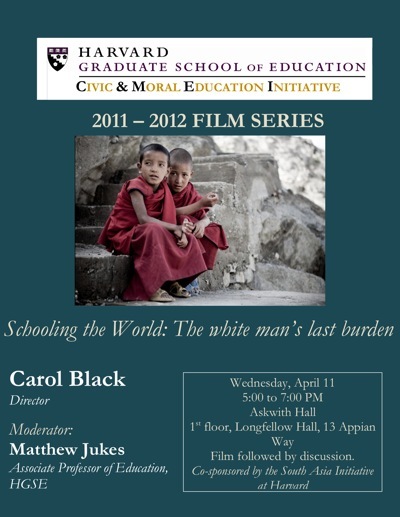 Screening and discussion with director Carol Black, Moderated by Matthew Jukes, Associate Professor of Education, HGSE. Co-sponsored by the Harvard South Asia Initiative. Monday, March 26. 6:30 pm. March 24-31, 2012. Screening and discussion with director Carol Black. Sorry, SOLD OUT! Thursday, March 22, Marsh Theater, Berkeley. 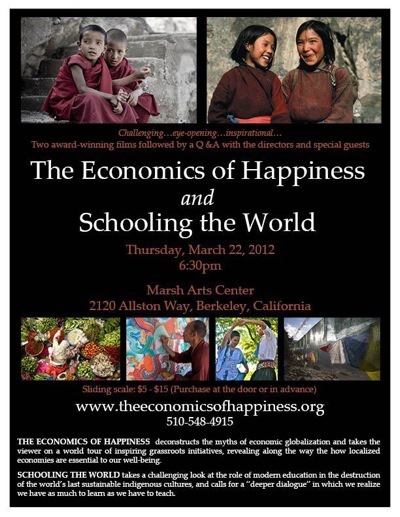 Special pre-conference screening of Schooling the World and The Economics of Happiness featuring Helena Norberg-Hodge, Vandana Shiva, Bill McKibben, Manish Jain, Richard Heinberg, Juliet Schor, Samdhong Rinpoche and many more. Discussion after the film featuring directors Carol Black, Helena Norberg-Hodge, and panelists from the films and conference. Click HERE for information. To purchase tickets, click HERE. For information and to register for The Economics of Happiness Conference, click HERE. Monday, March 12, 7:00 pm. Friday, March 9, 2012. University of Alberta Campus, ETLE 1-003. Saturday, March 3, 2012. Hosted by TRIBE, University of Kent Anthropology Society. February 23-24, 2012. Screening and keynote by director Carol Black. Click HERE for information. Thursday, February 23, 2012, 7 pm. Marsh Hall, Taylor Auditorium, Pacific University. Click HERE for information. February 16-17, Universidad Autónoma de Chiapas. Click HERE for information. Thursday, February 16, 2012. Ukrainian Cultural Centre. Call Heather at 250-885-2776 for information. Friday, February 10, 2012. Screening and discussion with radical educators and learners from our community at the Providence Free School, a decentralized network of community members sharing knowledge & skills in a popular-education model. Tuesday, January 24, 2012. Sarrat Center. Saturday, January 14, 2012. 7:00 pm. Lecture by Amy Goodman, host of “Democracy Now!” followed by a screening of “Schooling the World” and discussion with director Carol Black. Click HERE for information. Sunday, January 15, 2012. 3:30 pm. Screening and discussion with director Carol Black. January 12, 2012. Contact Patti O’Brien Beaumont for information. Tuesday, January 10, 2012. 5:00 pm. Saturday, December 17, 2011. Film screening as part of launch of Global Public Service & Leadership course for 12th grade students. Contact David Angwenyi for information. December 15, 2011. Click HERE for information. Friday, December 9, 2011. Location TBD. Check back for final details. EDUCATION GRADUATE STUDENT ASSOCIATION, Simon Fraser University, Vancouver, B.C. Tuesday, November 29, 2011. 6:00 pm. Click HERE for information. Thursday, November 24, 2011. 4–6:30 pm. Screening and discussion. Click HERE for information. Wednesday, November 23, 2011. 7:30-9:30 pm. Screening and discussion. Click HERE for information. November 17, 2011. 9 am. Screening and discussion with director Carol Black. Click HERE for information. November 18-20, 2011. Click HERE for information. Thursday, November 17, 2011. 7 pm. University Center Theater. Click HERE for information. November 16-17, Co-hosted by the Department of International Education, in celebration of International Education Week. Click HERE for information. Saturday, November 12, 2011. 6:05 pm. Click HERE for information. Friday, November 11, 2011. 8 pm. Subud House. Click HERE for information. Wednesday, November 9, 2011. Screening and Skype Q&A with director Carol Black. Click HERE for information. Monday, November 7, 2011. 6:30 pm – 9 pm. Screening and panel discussion. Click HERE for information. November 4-5, 2011. Click HERE for information. Thursday, November 3, 2011. 7 pm. Clicke HERE for information. Friday, October 28, 2011, 7:40 pm. Click HERE for information. Monday, October 24, 2011. Vikhroli Teach for India office. Saturday, October 22, 2011. 5:30 pm. The People’s Place. Click HERE for information. Friday, October 14, 2011. 4:30 pm. Click HERE for information. Saturday, October 8, 2011, 2 pm. Screening and discussion with director Carol Black and Bioneers indigenous program manager. Click HERE for information. Monday, October 3, 2011. 7 pm. Click HERE for information. September 23, 2011. Screening followed by Skype Q&A with director Carol Black. September 23-25, 2011 Click HERE for information. September 23, 2011. 8 pm. Click HERE for information. Friday, July 29, 2011, 7 – 9:30 pm. Click HERE for information. July 8-18, 2011. Click HERE for information. July 9, 2011, 7 pm. July 3-14, 2011. Devon, England. July 4, 2011, 7 pm. Screening followed by discussion moderated by Nosheen Ali, UC Berkeley. Click HERE for information. Saturday, June 25, 2011, 6:10 pm. Click HERE for information. June 25, 2011. For information email sswaldorfns.org or call 902- 624-0874. June 24, 2011. Screening followed by Skype Q&A with director Carol Black. Sunday, June 19, 2011, 4:30 gather, 5:15 pm screening followed by panel discussion and Skype Q&A with director Carol Black. Saturday, June 18, 2011, 6-9:00 pm. Screening and discussion. Click HERE for information. June 15, 2011. Email info@schoolingtheworld.org for info. Wednesday, May 11, 6:15 pm. Screening and discussion, Frontier Cinema, Brunswick, Maine. CLICK HERE for information. Thursday, May 5, 2011 7:00 pm. Opening night screening, Regent Showcase Theater. CLICK HERE for information. Wednesday, April 20, 2011 6:00 pm. Staff screening and discussion. Friday, April 15, 2011 7:30 pm. Screening followed by Skype Q&A with director Carol Black. Friday April 15, 7:00 pm CLICK HERE for information. Wednesday, April 6, 2011, 7:00 pm. Screening and talk with director Carol Black, Lang Performing Arts Center. NATIONAL GEOGRAPHIC ALL ROADS FILM PROJECT, Washington, D.C.
Saturday, April 2, 2011 7:00 pm. Screening and panel discussion with anthropologist Wade Davis and director Carol Black, National Geographic Headquarters. Saturday, March 5 , 2011, 4 pm. Sunday, March 6, 2001, 2pm. Saturday, March 5, 7 pm, Rhizome Cafe. Screening and Skype Q&A with director Carol Black. Just added: Additional screening Sunday, February 27, 6pm. Wednesday, February 23, 2011. Screening followed by Q&A with director Carol Black. sold out. Saturday February 26, 2011. Screening followed by Q&A with director Carol Black. sold out. WORLD COMMUNITY FILM FESTIVAL, Grand Forks, B.C. Thursday, February 24, 2011, 7 pm. Just added: “Best of Fest” Screening on February 15, 7 pm, 2011, North Island College. Tuesday, January 25, 2011. A panel discussion, moderated by doctoral student Joseph Henderson, will follow the screening. Panelists will include Mary Jane Curry, a Warner School associate professor of education; Daniel Reichman, a University of Rochester assistant professor of anthropology; Charles Temple, a Hobart and William Smith professor of education; and Stephanie Waterman, a Warner School assistant professor of education. January 17, 2011. Screening and discussion. Tuesday, October 5, 4–6:30 pm. Dr. Madhu Suri Prakash, Professor of Educational Theory and Policy at the College of Education of Pennsylvania State University, and Gustavo Esteva, a leading environmental activist, author, and founder of the Universidad de la Tierra in Oaxaca, Mexico, will lead a discussion of the film. They propose a radical rethinking of the “development” paradigm, in which schools provide knowledge and orientations that alienate students from the deep, grounded educational processes occurring in their cultures and communities. September, 2010. Screening and discussion with Gustavo Esteva of Universidad de la Tierra. July – August 2010. Screening and discussion with Helena Norberg-Hodge. Rough cut /sneak preview: January, 2009. Screening and Q&A with director Carol Black. Rough cut / sneak preview: May, 2008. Screening and panel discussion with anthropologist Wade Davis and director Carol Black.